Enjoy these free printable alphabet activities for letter G: coloring pages, color posters, handwriting practice worksheets, and more. Most are available in standard block and D'Nealian manuscript font. These are suitable for preschool, kindergarten and first grade. Visit alphabet letter G preschool activities and crafts for additional resources. 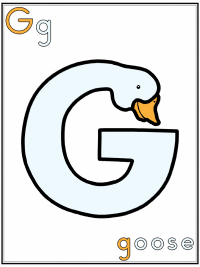 Visit alphabet letter G preschool activities and crafts for additional resources.